Der Artikel Radha Agrawal: Belong wurde in den Warenkorb gelegt. It's the great paradox of the digital age, what Radha Agrawal calls "community confusion"¿the internet connects us to hundreds, thousands, even millions of people, and yet we feel more isolated than ever, with 1 in 4 Americans saying they have zero friends to confide in. Where are our people? 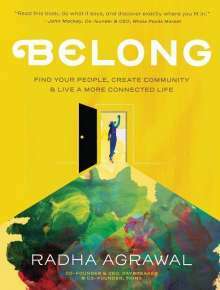 The answer is found in Belong, an inspirational, interactive, highly energetic and beautifully illustrated guide to discovering where and with whom you fit. After suffering her own bout of community confusion, Agrawal embarked on a journey that ultimately resulted in co-founding Daybreaker, a transformative phenomenon described as "Studio 54 for millennials," where hundreds of thousands of people get up at the crack of dawn, meet in event spaces in 18 cities around the world, and, completely sober, dance¿with abandon, with joy, with a deep sense of community. Now she's distilled her experience for finding meaningful connections into a step-by-step process. The first step is GOING IN¿discovering personal intention, gauging our energy level, understanding how we do (or don't) show up for others. Then comes GOING OUT¿looking out, like the eyes on the cover, to find a few special friends; a fully engaged group with similar business, artistic, or social aims; or both. Connectedness is the most significant factor in human happiness, far more than money or status. Belong is a creative blueprint for bringing this most important dimension back into our lives.